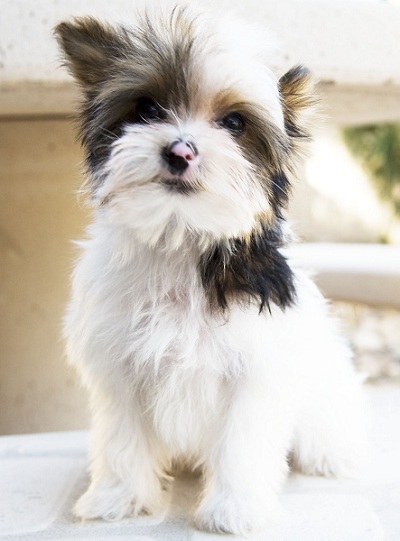 Welcome to JackpotPuppies.com, home of the most stunning yorkie puppies and parti yorkie puppies for sale. Our AKC yorkie puppies for sale and AKC parti yorkie puppies for sale are top quality and absolutely gorgeous. We specialize in teacup and toy sizes. All of our yorkie puppies for sale and parti yorkie puppies for sale all have that "show dog" look with beautiful silky coats, baby doll faces, and loving personalities to match them. Each yorkie puppy is raised in our home in Phoenix, Arizona (AZ) and loved as one of our own family members. Each yorkie puppy receives personal attention and the best care by our loving family. Each yorkie puppy is up to date on their shots and wormings, and comes with a 1-year health guarantee and AKC registration papers (if any). Feel confident knowing you are getting the puppy you pay for. We have the tiniest micro teacup yorkies out there! We never lie about age or sizes. Our micro teacup yorkies stay small and we put our reputation behind that. Gotti & Ritzy - AKC Parti Yorkie Puppies - 1 Male Available! Gotti and Ritzy had a gorgeous litter of 2 AKC parti yorkie puppies. Both of them are males and have top-of-the line genes in them. These two will be perfect future tiny studs or will make a great pet! Coming from championship blood, they also have the golden parti gene, as well as the chocolate parti gene. Tiny is 1.5 years old and available for $2,000. We offer shipping to all 50 US states and some parts of Canada: Alabama, AL, Alaska, AK, Arizona, AZ, Arkansas, AR, California, CA, Colorado, CO, Connecticut, CT, Delaware, DE, District of Columbia, DC, Florida, FL, Georgia, GA, Idaho, ID, Illinois, IL, Indiana, IN, Iowa, IA, Kansas, KS, Kentucky, KY, Louisiana, LA, Maine, ME, Maryland, MD, Massachusetts, MA, Michigan, MI, Minnesota, MN, Mississippi, MS, Missouri, MO, Montana, MT, Nebraska, NE, Nevada, NV, New Hampshire, NH, New Jersey, NJ, New Mexico, NM, New York, NY, North Carolina, NC, North Dakota, ND, Ohio, OH, Oklahoma, OK, Oregon, OR, Pennsylvania, PA, Rhode Island, RI, South Carolina, SC, South Dakota, SD, Tennessee, TN, Texas, TX, Utah, UT, Vermont, VT, Virginia, VA, Washington, WA, West Virginia, WV, Wisconsin, WI, Wyoming, WY, Canada, Canada, Canada. We ship yorkie puppies and parti yorkie puppies for sale. Our tiny yorkie (yorkshire terrier) puppies, sometimes called by teacup yorkie, t-cup yorkie or micro yorkie, micro teacup yorkie, are raised by Yorkshire Terrier Breeders (our friends) who strive to raise happy, healthy puppies for you and your family. All teacup yorkie (Yorkshire Terrier) puppies are up to date shots and wormings. All of our puppies are vet checked before leaving and each puppy has a health record. We also provide a one year guarantee against genetic diseases for each puppy. Your teacup yorkshire terrier (yorkie) puppy is waiting for you. We also list puppies for some of our friends that are breeders of Parti Yorkies, Maltese, and Pomeranian Puppies.